Farhad has been in business ever since he first came to America in the 1970s, so he definitely has a nose for what works at this point. I’m personally honored that he and his partners (wife Faranak, sister-in-law Kambiz and close friends Farzaneh and Noushin ) have chosen to partner with Edible Arrangements. I have a feeling their enthusiasm will be rewarded. Certified Happiness. It’s not just a catchy tagline, but rather a very real philosophy that is taken seriously as a corporate goal by all of us here at Edible Arrangements. We hold ourselves to the highest standards, and make superior customer service a priority at all times. That’s why when we don’t completely live up to those standards, there is no one who is more disappointed about it than us. After all, our mission is to WOW you each and every time. It pleases me greatly to know that our Edible Arrangements franchisees brought happiness to more people this Valentine’s Day than ever before. In locations across America and around the world, they worked tirelessly to fulfill hundreds of thousands of orders on our busiest day of the year, and are eminently proud to service their local communities. That said, there were also some customers whose orders were either delivered in an untimely fashion, or not delivered at all. And for this, I personally apologize. It may have been a small percentage of you, but as far as I’m concerned, if we successfully fulfill a thousand orders and miss one, then we have fallen short of our mission. 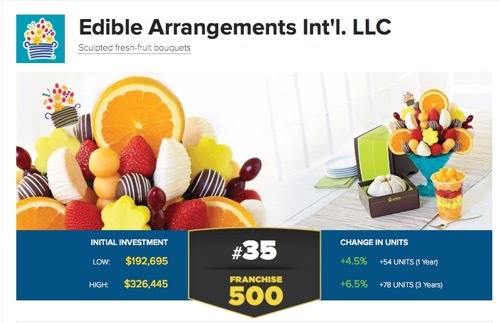 Edible Arrangements Fruit Experts are among the most dedicated and passionate franchisees in the world. As such, they hold themselves accountable when things go wrong—as we all do on the Edible Arrangements team. When standards are not met, we all seek to address the problems promptly and effectively. This is why our franchisees are working around the clock to do just that. We are already hard at work revamping our operations and formulating strategies to minimize these issues going forward. In short, we are learning from what went wrong this time around. To all those customers and recipients whose Valentine’s Day was brightened by Edible Arrangements, I thank you for placing your confidence in us, and allowing us to help you share your love. Without you and your support, we would never have been able to build the Edible Arrangements brand in the first place. And if we missed our mark for any of you, do not hesitate to reach out and let us know. Your voices will be heard, and I can assure you that all our owners will do whatever it takes to make it up to you. Because certifying happiness is more than a mission statement—it’s our way of life. I still get energized every time a new store opens anywhere, but there’s a particular thrill that comes with opening a new store in a whole new area of a country. The excitement of bringing Edible Arrangements to a new set of people to be amazed by our products is so gratifying, and I love knowing that another new business owner will be bringing happiness to these customers for years to come. On January 18 Grand Opening ceremonies were held celebrating the newest Edible Arrangements store in Abu Dhabi, United Arab Emirates. This store is in Al Ain, the fourth largest city in the UAE, which is located on the border with Oman. Our other store in Abu Dhabi is located on the other side of the country in the capital city of Abu Dhabi on the central western coast of the Persian Gulf, so we’re excited to bring the concept to a brand new region of Abu Dhabi. This newest store is owned by well-known businessman Mohammed Al Khazraji. H.E. Sheikh Salem Bin Mohammed Bin Hamad Bin Rakadh Alamir, Member of the Federal National Council, was a guest of honor at the Grand Opening gala. The store is in a fabulous location at the entrance of the new Jumeirah Hotel which is part of the prestigious Al Ain Mall in the heart of Al Kuwaitat district. I was so impressed when I first met Mohamed – his business background in IT, food service and the international franchise industry, his education, and his commitment to preserving and enriching his culture. And I consider it an honor that part of that enrichment includes Edible Arrangements. Mohammed’s family has owned an Al Ain based local cuisine catering establishment for the past 20 years. A seasoned IT professional and successful entrepreneur, Mohamed takes his responsibilities towards society seriously as an active member of the renowned charitable organization Wataniya, among others. Mohammed wanted to open an Edible Arrangements business enterprise because he felt that our concept would work well in the niche Arab and Expatriate communities. Now that I’ve met some of them and seen their reactions, I totally agree with his assessment! Mohammed is planning to open more branches in other parts of the district in the coming months, and if the reception he has gotten here is an indicator, his other locations will be just as well received. Fred has taken ownership of his second Edible Arrangements store in Mississauga, Ontario in Canada. He opened his first location, also in Mississauga in April of 2010. It was obviously the right choice. In July of 2011, Fred was awarded the “Pineapple Star” award for Canada, one of Edible Arrangements prestigious awarded presented each year at the annual Edible Arrangements Convention. Why did he win this word? Because his passionate about his work -and life. I’ve always believed that if you are passionate in what you do, you will succeed. Fred is the perfect example of a passionate person, as well as an amazing person and franchisee. While Fred works with fruit now, his background traces to the very soil his products come from! He earned his undergraduate degree in Physical Geography and Geology, and did graduate work-in soil science. Fred then worked in the educational publishing industry, and the not for profit sector working for industry trade associations and community organizations. When Fred decided to look for franchise opportunities, he did what most researchers do – started on the internet. Fred discovered the Edible Arrangements concepts, and was immediately drawn to the healthy nature of the product, which can be hard to find in a food franchise. He was further attracted by the uniqueness of the concept in the marketplace and the fact that Edible Arrangements has no direct competitors. Fred and his wife, a Registered Nurse, have two children and a Nova Scotia Duck Tolling Retriever.